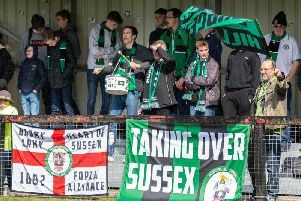 It used to be the case thant whenever the two longest serving teams in the Southern Combination League Premier Division met, whoever was at home out of Hassocks or Arundel would tend to win the game. The one thing that Arundel do have in the battle to avoid the drop that other teams in and around the relegation zone don’t is an out-and-out goal scorer in the shape of Gray, and it was he who gave the Mullets the lead on 57 minutes with his 14th goal of the season. Two key moments from a Hassocks point of view followed that. The Robins’ own improvement from regular strugglers to their current mid table position has been founded on acquiring a quality striker of their own in Phil Johnson, but the normally reliable marksman fluffed his lines when miscuing a James Littlejohn cross from just five yards out. Those two moments lifted Arundel’s spirits and they duly added a second through Harry Russell with 70 on the clock. Hassocks: Green; Tighe, Jacques, Badger, Whittingham; Blake, Mills, Enticknap, Littlejohn; Benson, Johnson. Subs: Slaughter, Bull, Lindsey (used).